Every year there are new trends, new styles, and comebacks that happen in everything from haute couture to cars. Bathroom design is no different. Every year, there are trends that industry insiders watch. Part of the modern design in bathrooms is to give the room a focal point. It might be a bathtub, a vanity, or a shower, but the room is designed around a specific object that’s meant to draw the eye as soon as you enter the room. The old days of simple chrome are gone. Brushed nickel and oiled bronze are the “in” metals. Fixtures in these designs add more than simply a practical aspect; many are designed as works of art in themselves. From unique patterns to bright colors, tile is back in in a big way. Tile gives the room the crisp look that homeowners want while still being durable and easy to clean. Clean white tiles with white vanities and tubs are in. The ultra-modern and super clean lines of white porcelain can make the bathroom sparkle. It allows for color accents that are subtle and neat. There is a move away from cabinets with doors to shelves that are open. This lends a more open and airy feel to the room. It also allows things like towels to become part of the decorations of the room. For all of the bright porcelain mentioned above, natural wood is also making a comeback. To Americans, the wood look is reminiscent of the familiar Restoration Hardware style. 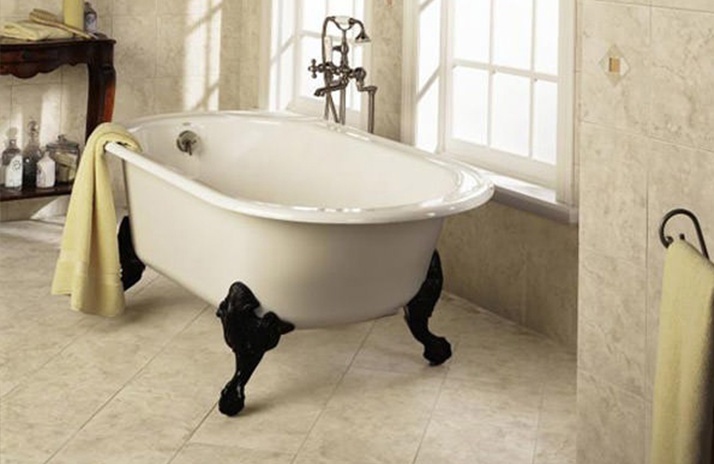 A technology that dates back to the Romans, heated bathroom floors are here to stay. With the push of a button, you can have floors that warm your feet before and after your shower. It’s hard to not want in floor heating once you have it! Of course, there are always more trends in the world, but these are a few of our favorites. These are also the ones that feel the most classic and most likely to keep their novelty for years. Contact us today to discuss your next remodeling project!